Once again, the sun shines over the South Wales valleys but this also means that deliberate grass fires start throughout the South Wales valleys. Since the start of April 2015, South Wales Fire and Rescue Service have attended over 800 deliberate grass fires in the valleys and surrounding areas. Figures shown by South Wales Fire and Rescue Service, indicates that fires started with intent have risen from 309 to 874 compared to April 2014 – which is an increase of 183%. Between the time of April 1st 2015 – 28th April, 2015, the county borough of Rhondda Cynon Taf was the area which was most hit by the deliberate grass fires with over 320 fires being tackled by South Wales Fire and Rescue Service. Overall, 874 deliberate grass fires were set in South Wales in April 2015. 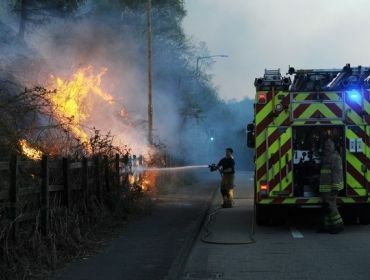 South Wales Fire and Rescue service will be working closely with local policing units and South Wales Police over the summer and hot weather periods to cut down, and put a stop to deliberate grass fires. 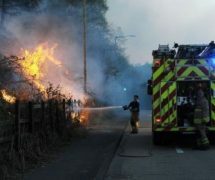 Remember, you can face imprisonment and up to a ?5,000 fine if caught or seen lighting deliberate grass fires. Also, don’t forget that deliberate grass fires can risk lives, not just of the wildlife, but nearby houses and even other members of the public who may need the help of the fire service for a house fire or road traffic collisions. If you see anyone or know anyone who’s lighting fires, then don’t be frightened to report them to your local police station or you can call Crimestoppers on 0800 555 111 or the non-emergency number 101. Making that phone call can saves lives of the local wildlife and the general public.